New Paths. From the doctor to the lawman to the soldier, these paths provide you with suggestions and advice on building a character well-suited to the rough and tumble action of the genre. New Feats. A fistful of new options. New Equipment. Now you can outfit your character with weapons appropriate to the period. An Overview of the Wild West. This section, for the Narrator, gives a quick look at some of the more famous characters and locations in the Old West. Path Progressions. 180 stat blocks, one for every level between 1 and 20 for all nine paths included in the book. Need a 5th-level outlaw fast? We've got you covered. 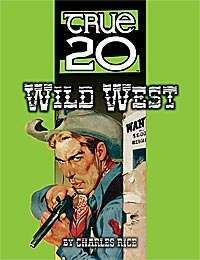 Written by Charles Rice, with editing and development by Philip Reed, True20 Wild West has been carefully constructed to give you everything you'll need to dive right into the action. Just add True20 Adventure Roleplaying, your players, and your imagination and you're ready to rob the train, rustle some cattle, and go head-to-head with the toughest hombres this side of the border. * If this edition of the publication is updated due to the discovery and correction of typos or errata, you will get a free download of the corrected edition. This title was added to our catalog on March 10, 2007.